Imaging and mapping of electric fields at radio frequencies (RF)* currently requires the use of metallic structures such as dipoles, probes and reference antennas. To make such measurements efficiently, the size of these structures needs to be on the order of the wavelength of the RF fields to be mapped. This poses practical limitations on the smallest features that can be measured. New theoretical and experimental work by researchers at the National Institute of Standards and Technology (NIST) and the University of Michigan suggests an innovative method to overcome this limit by using laser light at optical wavelengths to measure and image RF fields. The new technique uses a pair of highly stable lasers and rubidium atoms as tunable resonators to map and potentially image electric fields at resolutions far below their RF wavelengths (though not below the much shorter wavelengths of the lasers). This advance could be useful in measuring and explaining the behavior of metamaterials and metasurfaces-structures engineered to have electromagnetic properties not found in nature, such as the illusion of invisibility. Imaging with sub-RF wavelength resolution also could help measure and optimize properties of densely packaged electronics and lead to new microscopy systems and imaging sensors. Typically, RF field measurements are averaged over antenna dimensions of tens of millimeters (thousandths of a meter) or more. NIST's prototype technique has resolution limited by the beam widths of the two lasers used-in the range of 50 to 100 micrometers (millionths of a meter.) The technique was used to map RF fields with much longer wavelengths of 2863 and 17,605 micrometers (frequencies of 104.77 gigahertz and 17.04 gigahertz), respectively. The NIST and Michigan researchers mapped field strength as a function of position at resolutions as low as one-hundredth of an RF wavelength, far below normal antenna limits. Such data might be used to make colorized 2D images. In theory, the technique should work for wavelengths ranging from 600 to 300,000 micrometers. The rubidium atoms are in a hollow glass cylinder (see photo), which is traversed down its length by two overlapping laser beams that act as stimulants and filters. First, a red laser excites the atoms, which initially absorb all the light. Then, a tunable blue laser excites the atoms to one of many possible higher energy ("Rydberg") states, which have novel properties such as extreme sensitivity and reactivity to electromagnetic fields. Next an RF field-at the frequency to be mapped or imaged-is applied. This field alters the frequency at which the atoms vibrate, or resonate, altering the frequencies at which the atoms absorb the red light. This change in the absorption is easily measured and is directly related to the electric field strength at that part of the cylinder. By moving the cylinder sideways on a track across the narrow laser beams, researchers can map the changing field strength across its diameter. The blue laser can be tuned to excite the atoms to different states to measure the strength of different RF frequencies. In the demonstration, researchers measured the strength of standing waves at specific locations inside the glass cylinder. For the two frequencies studied, measurements of the field agreed with results from numerical simulations. The imaging technique is a spinoff of an ongoing NIST effort to develop a method that will, for the first time, directly link electric field measurements to the International System of Units (SI). NIST developed the new measurement and imaging technique. 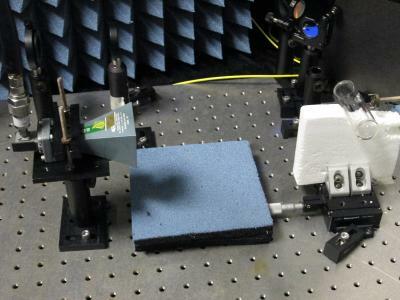 University of Michigan co-authors provided the tunable blue laser and assisted in the measurements. The project is funded in part by the Defense Advanced Research Projects Agency. * The term RF is used here to span the conventional radio, microwave, millimeter wave and terahertz frequency bands.